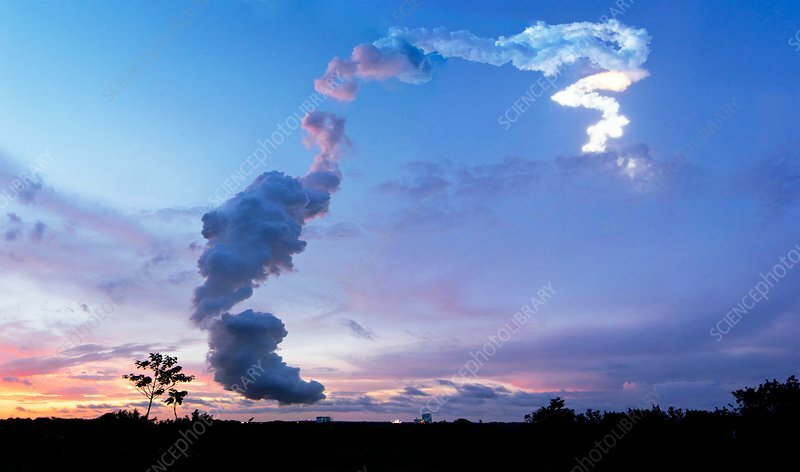 The plume of an Ariane 5 rocket launched from the Guiana Space Centre (Centre Spatiale Guyanais, CSG) near Kourou, French Guiana. The plume is partly water vapour (i.e. cloud), the result of combusting hydrogen and oxygen propellants. The image is taken after local sunset, but the sun still illuminates the plume at high altitude. The launch pad (illuminated) and launcher integration building are visible at lower centre.